The Ridgid 15-Gauge Angled Finish Nailer with Clean Drive is part of their latest series of finish nailers featuring a tighter drive track to reduce the number of jams and misfires you get. With a tighter drive track to reduce jams, a solid feature set, and Ridgid’s Lifetime Service Agreement, the R250AFF is worth any Pro’s consideration. The major upgrade for this Ridgid 15-gauge nailer is Clean Drive. It’s a tighter, more precise drive track that greatly reduces the number of jams and misfires you get over time. Ridgid claims you’ll get up to 17x more perfect drives, including with toe nailing. Months after our first tests with the 18-gauge version, we’re still not having any jam issues. No nailer is perfect and even the Ridgid 15-Gauge Angled Finish Nailer with Clean Drive eventually will. When that happens, the access door on top is easy to open by flipping the latch release forward. The magazine is a rear loading style that’s mainly plastic construction. The nail track on the inside is metal. A bypass pusher makes loading the nails easy, though it doesn’t slide as snappy as an all-metal magazine. The upside is that it helps keep the weight down some. Thumbwheels depth adjustments are pretty standard. Ridgid place theirs on the right side of the nose. What sets it apart is that it’s super-smooth to adjust. The Ridgid R250AFF sticks with a narrow nose design that’s easier to see some of the competition. Ridgid says it has an aggressive toenailing tip. It’s narrow and rounded, so it’s not going to stick as well as the barbs on a framing nailer. At 4.2 pounds, Ridgid comes in on par with most of its competition. You can save a few ounces with Makita or gain a couple with Bostitch. Like most nailers in this class, there’s a forward lean, but nothing out of the ordinary with how it balances. It’s no surprise to find HexGrip overmold to increase the comfort and grip security of the handle. You’re not likely to bump fire at a crazy rate with a finish nailer, and I was able to consistently drive 2-1/2″ nails at roughly a 1/2-second interval without an issue. It’s possible to shoot faster than that, but it’s tough to get good results no matter what nailer you’re using. 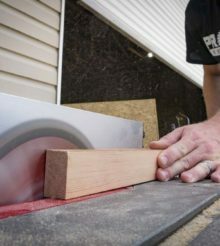 Moving to our test grid of poplar and PT pine, the Ridgid 15-Gauge Angled Finish Nailer sinks 2″ nails with ease. I’d have been shocked if that wasn’t the case, though. The big deal on our grip is being able to test accuracy. Ridgid’s nose design gives you a better sightline than some of their competition. I was able to keep each shot within 2 mm of my target – close enough for the kind of work you do with a 15-gauge nailer. The amount of recoil you get from firing nails with this model is on par with what we expect from a 15-gauge nailer. Ridgid’s $169 price tag sits in the middle of the group with Hitachi and Makita benefiting from some current sale prices*. With its overall design and feature set, you get a decent amount of bang for your buck. Ridgid continues to drive the pneumatic nailer line forward with features that make a difference and a competitive price. With a Lifetime Service Agreement that even covers driver blades, the R250AFF is a compelling choice for any Pro.